A tale of wasabi peas...IN SPACE! 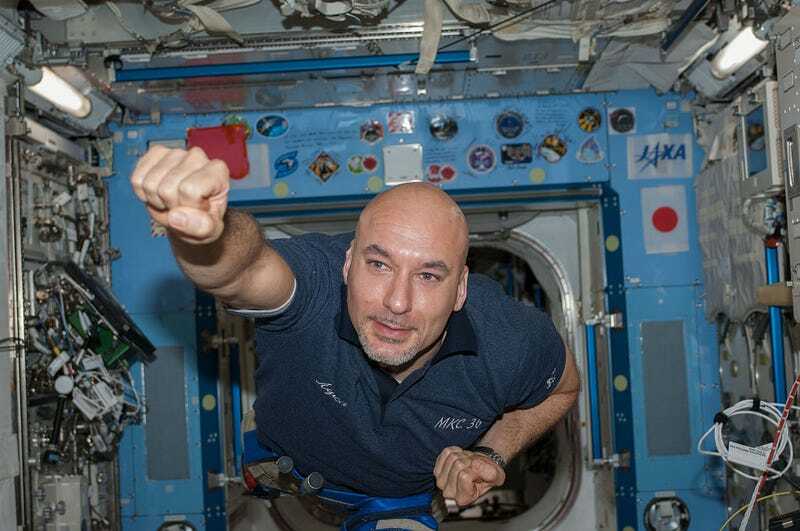 Italian astronaut Luca Parmitano writes of a recent Homer Simpson-ish encounter with some wasabi peas on the International Space Station. Among the snacks that attract my attention I see an untouched jar of peas covered with wasabi – a very spicy, green paste from Japan. We’ve inherited the peas from a colleague: they’re certainly not part of the standard menu. Well, I’m on the lookout for a bit of treat, so why not? Oblivious to the tragedy that is about to unfold, I take the can and open the plastic cover. Underneath, there’s a thin airtight aluminum seal, like the ones on yogurt pots. I get hold of the flap, and with more force than I mean to, I pull to remove it. I hear a slight pop and suddenly find myself surrounded by hundreds of green peas flying around like a colourful big bang. The pea cloud spreads with astronomical speed, spiralling out of control. As I struggle to scoop as many peas as I can back into the can, I have a flashback to a story I read when I was a kid, involving a little monkey who drops all the peas in his hands just because he wants to pick up one more pea from the ground. No matter how hard I try, there are more peas bouncing off the bottom of the can than stay inside it. Completely forgetting to hold onto something, I find myself rolling around together with the pea cloud (where is that measured slowness now? And that consummate calm?). So I decide to try and eliminate the problem at its root, capturing the peas as they float by with my mouth and eating them quickly. The plan works, except for one small detail: wasabi peas are extremely spicy. With my eyes streaming and my tongue on fire, I finally manage to catch the last few peas and put them back in the can. I look around, but I am all alone: no one has witnessed my clumsiness (except the witness that matters the most: me). Believing myself safe from future embarrassment, I get back to work with consummate calm and elegance, my tongue still burning from the infernal wasabi and my pride stinging even more. His blog has some interesting stories of life on the ISS.